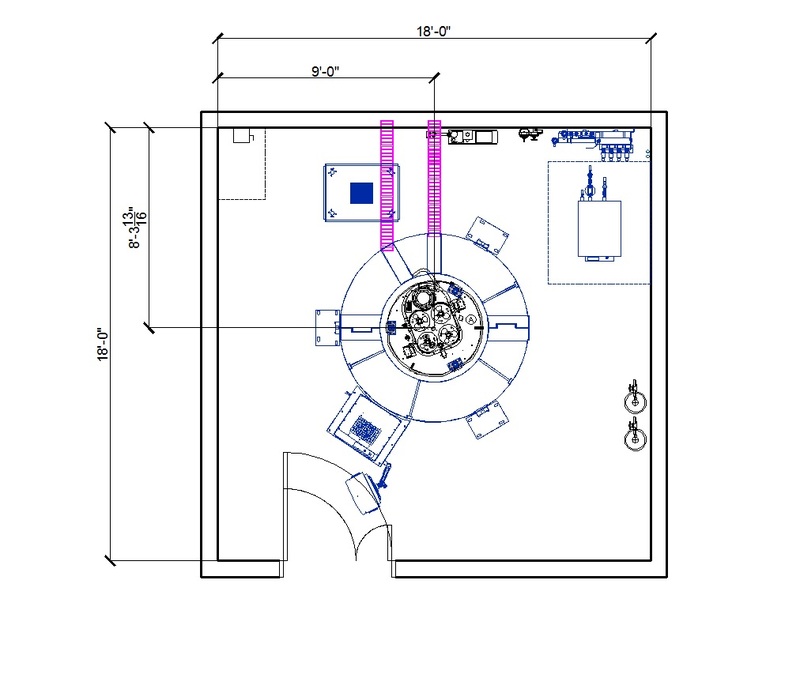 ﻿ OncoMed Solutions - Cyclotron - ABT Molecular Imaging Inc.
Cyclotron - ABT Molecular Imaging Inc. 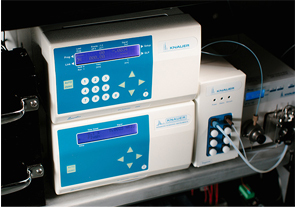 The BG-75 produces PET biomarkers and radioisotopes on demand. 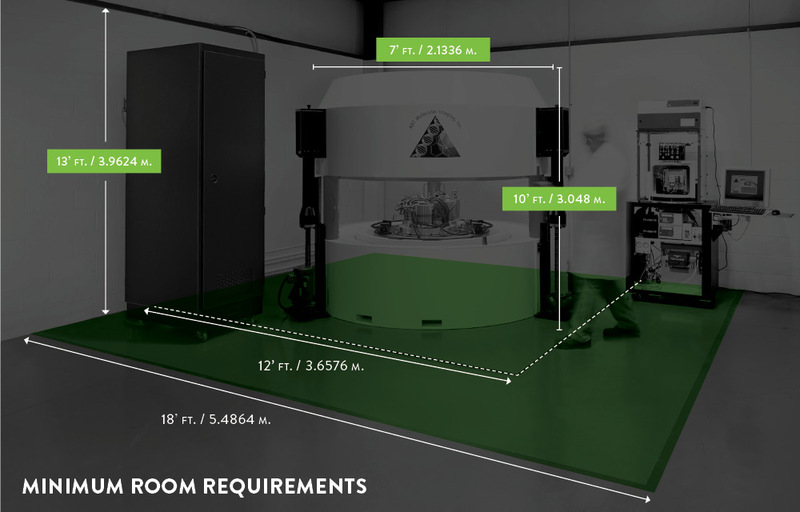 An integrated solution, the BG-75 encompasses an entire PET production lab in a 300 square feet (30 sq meter) room. 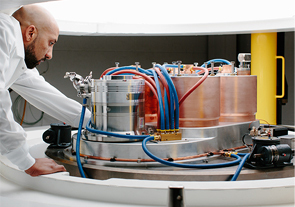 It includes a self-shielded mini-cyclotron for producing the positron emitting F-18 isotope and microchemistry system for labeling specific molecules with the positron emitting isotopes. 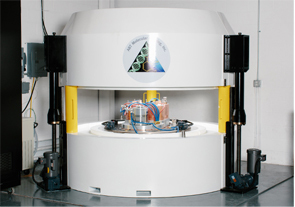 The unique BG-75 system is significantly smaller, easier to install and simpler to operate than conventional cyclotrons. Self-shielded, eliminating the need for a bunker to house the system. 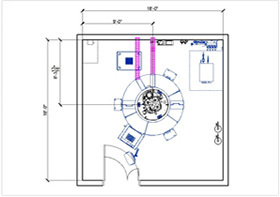 Shield opens vertically for servicing and provides radiation protection of <1 mR per hour in the typical room size specified. 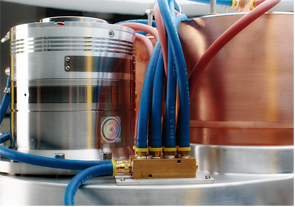 Micro-Chemistry module is also self-shielded and can be installed adjacent to the cyclotron shield for direct connection within the same room. 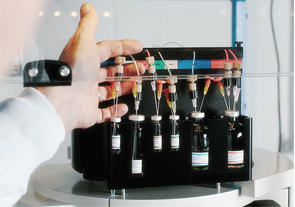 With a smaller footprint, lower cost and compact size, the BG-75 Biomarker Generator offers unparalleled advantages when compared to conventional cyclotrons. 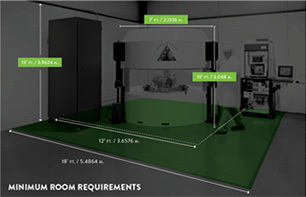 The integrated BG-75 Biomarker Generator requires significantly less facility space than conventional cyclotrons, as demonstrated in the figure below. Permission to use, copy, and distribute content from this web site is hereby granted for non-commercial use only, provided that the above copyright and relevant trademark notice appear in all copies and that the name of OncoMed-Solutions GmbH is not used in advertising or publicity pertaining to distribution of this documentation without specific, written prior permission. All images used on this site are owned or licensed by OncoMed-Solutions for use on this site only. Unauthorized use is prohibited. The information contained in this website is for general information purposes only. The information is provided by OncoMed-Solutions GmbH and while we endeavour to keep the information up to date and correct, we make no representations or warranties of any kind, express or implied, about the completeness, accuracy, reliability, suitability or availability with respect to the website or the information, products, services, or related graphics contained on the website for any purpose. Any reliance you place on such information is therefore strictly at your own risk. Every effort is made to keep the website up and running smoothly. However, OncoMed-Solutions GmbH takes no responsibility for, and will not be liable for, the website being temporarily unavailable due to technical issues beyond our control. If you open a customer account (account) with us and place an order, we will store your name, email address, delivery address and telephone number. We only use the above-mentioned data/information to internally manage your customer account (account), to process payments, for marketing purposes and marketing analyses and to inform you of the current status of your order. If you subscribe to our newsletter we will require your first name and surname, as well as a valid postal address and email address. In this case, the data/information is only used for administrative purposes. We may also use the data/information to inform you of important changes to our websites, services, current product changes/news or competitions. In order to comply with the Data Protection Act 1998 whilst simultaneously offering you maximum protection of your personal data, for our part we take strict security measures in relation to storing and encrypting your personal data. This also serves the purpose of preventing unauthorised access to said data. You can deactivate cookies or adjust your browser settings so that you have to manually accept the storage of a cookie. Your browser's "Help" section should include further information on how to make the necessary adjustments. If you completely deactivate cookies, it might be possible that you cannot use all of our websites' functions as intended. If you would like to remove your cookies, you can do so by selecting the option "sign out" on our websites. We reserve the right to pass on statistics or analytical data on our customers, as well as sales and visitor numbers, to selected and trustworthy third parties, although this information will not include any of your personal information. We are committed to fully complying with the Data Protection Act 1988. The data/information you provide us with may be transferred to an economic area outside of Europe for administrative tasks and/or order processing. The above-mentioned Data Protection Policy and the Data Protection Act 1988 are strictly adhered to in this respect. You may ask for access to or request information on the data/information stored by us at any time. To do so, please email us at info@oncomed-solutions.com. Our Data Protection department will be happy to send you the desired information within a maximum of 10 working days. By using these websites, you are irrevocably consenting to the above-mentioned conditions. Any amendments to this Data Protection Policy will be published in this section of the website as soon as they are officially announced. Should you have any further questions, comments or concerns relating to this Data Protection Policy, please contact us by sending an email to: info@oncomed-solutions.com. Wenn Sie bei uns ein Kundenkonto (Account) eröffnen und eine Bestellung erfassen, speichern wir Ihren Namen, Ihre E-Mail-Adresse, die Lieferadresse sowie Ihre Telefonnummer. Die oben genannten Daten/Informationen benutzen wir ausschließlich zur internen Verwaltung Ihres Kundenkontos (Accounts), für die Zahlungsabwicklung, weiter für Marketingzwecke und Marketinganalysen sowie um Sie über den laufenden Status Ihrer Bestellung zu informieren. Sofern erforderlich müssen wir die uns zur Verfügung gestellten Daten/Informationen bedingt zusätzlich an Dritte (z.B. Hersteller der Waren) weitergeben aber nur soweit dies zur Abwicklung Ihrer Bestellung/Zahlungsabwicklung erforderlich ist. Ferner benutzen wir die Daten/Informationen ggf. um Sie über wichtige Änderungen bezüglich unserer Websites, Services, aktuelle Produktänderungen /-neuigkeiten oder Wettbewerbe in Kenntnis zu setzen. Bei der Eröffnung eines Kundenkontos (Account) oder der Erfassung einer Bestellung stellen wir einen Secure Service zur Verfügung. Hierbei verwenden wir die den Branchenstandards entsprechende Verschlüsselungssoftware Secure Service Software SSL, mit welcher alle uns zu übermittelnden Daten vor dem Versand verschlüsselt werden. Um dem Data Protection Act 1998 zu entsprechen und Ihnen gleichzeitig ein Höchstmass an Schutz Ihrer persönlichen Daten zu bieten, wenden wir auf unserer Seite strikte Sicherheitsvorkehrungen bezüglich der Speicherung und dem Verschluss Ihrer persönlichen Daten an. Dies dient auch dem Zweck unberechtigten Zugriff auf dieselben zu verhindern. Aus Sicherheitsgründen und zum Schutz Ihrer Privatsphäre werden wir Sie vor dem Versand sensitiver Informationen oder der Annahme einer Bestellung bei Bedarf zur elektronischen Identifikation auffordern. Cookies sind kleine Informationspakete, welche von Websites aus auf Ihre Harddisk gesandt werden und es der Website erlauben, den Benutzer automatisch zu identifizieren, eine persönliche Begrüssung darzustellen und Elemente in einem persönlichen elektronischen Warenkorb zu speichern. Sie können Cookies deaktivieren oder Ihren Browser so einstellen, dass Sie die Speicherung eines Cookies manuell akzeptieren müssen. Der Sektion „Hilfe“ in Ihrem Browser sollten Sie zur Durchführung dieser Einstellungen weitere Informationen entnehmen können. Falls Sie Cookies komplett deaktivieren, wäre es eventuell möglich, dass Sie nicht alle Funktionen unserer Websites optimal nutzen können. Falls Sie Ihre Cookies entfernen möchten, können Sie dies über die Option „abmelden“ auf unseren Websites tun. Wir behalten uns vor, Statistiken oder Analysedaten über unsere Kunden, Verkaufs- und Besuchszahlen an ausgewählte und vertrauenswürdige Dritte weiterzugeben, wobei diese Informationen keine Ihrer persönlichen Informationen beinhalten werden. Des Weiteren behalten wir uns vor, gewisse Aufgaben und Funktionen an Dritte zu delegieren. Dies kann beispielsweise die Lieferung der bestellten Waren, die Datenverarbeitung, den Zahlungsverkehr oder Ähnliches betreffen. Hierbei verpflichten wir uns dazu, dass die Informationen von diesen Drittparteien in keiner als der unmittelbar zur Erfüllung der delegierten Aufgabe verwendet werden dürfen, hierbei binden wir uns an den Data Protection Act 1988. Die von Ihnen bei uns erfassten Daten/Informationen können zum Zwecke der Verwaltung und / oder der Auftragsbearbeitung in einen Wirtschaftsraum außerhalb Europas transferiert werden. Hierbei werden oben beschriebene Datenschutzregeln sowie der Data Protection Act 1988 strikt beachtet. Sie können von uns jederzeit Auskunft über Ihre bei uns gespeicherten Daten/Informationen abrufen bzw. verlangen. Bitte senden Sie uns hierzu eine Nachricht via Email an info@oncomed-solutions.com Unsere Abteilung Data-Protection wird Ihnen die gewünschte Information gerne innerhalb maximal 10 Arbeitstagen übermitteln. Durch die Benutzung dieser Websites erklären Sie unwiderruflich Ihre Zustimmung zu oben genannten Bedingungen. Änderungen der Datenschutzregelung werden unmittelbar nach Bekanntgabe an dieser Stelle online publiziert. Falls Sie weitere Fragen, Bemerkungen oder Bedenken zu dieser Datenschutzregelung haben, kontaktieren Sie uns bitte via E-Mail an: info@oncomed-solutions.com.